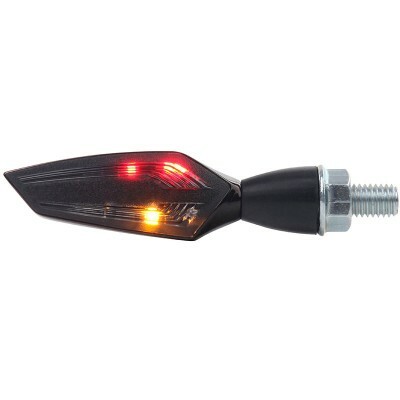 The m.blaze edge by motogadget is a 3in1 bolt-on turn signal in a visionary design. It's a turn signal, rear light and brake light in one housing. Using the motogadget TranzLight® Technology the light of the power LEDs is precisely controlled and emitted. The exclusively developed IntensiLED® System provides the highest and constant light intensity. The metal housing and the PMMA lens are designed with CAD software by free formed surfaces. The cutting edge design is oriented to modern automotive luminaires and establishes new dimensions at the motorcycle market. The m.blaze edge is available plated in Chrome and Dark-Chrome. The m.blaze edge has an E-mark as rear turn signal, as rear light and brake light. The turn signal can be installed like any other LED turn signal with power resistors or all of our load independent flasher relays (m.flash, m.wave, m.stop, m.relay+). Please order always a right and a left turn signal when used as a pair. Here you will find manuals, drawings and further information for the product family. Please regard the serial no. of your product, if there are more than one manuals for each product. Usually you will find the serial no. on a label with a bar code at the backside. At the m.unit it's on the frontside. Technical information for this specific product.